Inter-Motion Inc. was established in 1984. 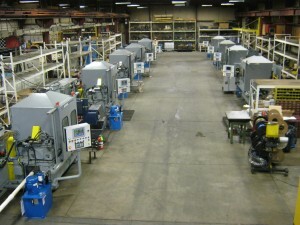 Inter-Motion is a full service professional machinery rebuilder and retrofitter that offers a wide range of additional services, including robotics, automation, custom machine design and custom manufacturing. Based in Kearney, Nebraska, our roots run deep into the Midwest work ethic that puts value and workmanship above all else. Situated virtually in the middle of the U.S., and just minutes from Interstate 80, Inter-Motion is also centrally located, which allows us to easily service customers from coast to coast and worldwide. At Inter-Motion, we take a two-fold approach to quality control that’s based on a perfectionist philosophy. First, we realize that quality can’t be inspected into a product. It has to be part of a strong work ethic that ensures that quality goes into every step of design and construction of the machine itself. In the meantime, we rely on complete in-house statistics to keep track of each rebuilding component. In-house state of the art Renishaw laser measurement technology is used to align machines. We also perform thorough checks on all parts — whether they’ve been purchased from a vendor or custom made at our facility. Once we’re certain the machine’s construction is sound, we perform rigorous tests by doing complete S.P.C. run-offs. These tests are carefully documented, then assembled into a report for your approval. Finally, our technicians accompany the machine to your facility, where they perform a second run-off to verify performance. Most importantly, our staff thoroughly understands your need for quality, reliability and service. Company founders Jim Zecha and Ronny Roberts have more than 75 years combined in the machine rebuilding business, and they’ve sought out some of the most talented machinists, technicians and electricians in the business. We have rebuilt more than 1,100 machines in the past 25 years, and our greatest source of pride is the fact that our customers continually supply us with repeat business and trust us to take their old machines to the next level. Contact us for more information and download our Inter-Motion literature. © 2019 Inter-Motion. All Rights Reserved.